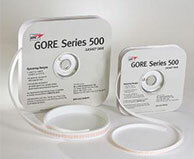 GORE Gasket Tape Series 500 has exceptional creep resistance and delivers reliable sealing performance for large steel flanges. Resistant to all media pH 0-14, except molten alkali metals and elemental fluorine. For industrial use only. Not for use in food, drug, cosmetic, or medical device manufacturing, processing, or packaging operations.